A first-person, on-rails shooting game that requires the Super Scope. Bowser and the Koopa Kids have attacked Jewelry Land and stolen the 12 Gems. Prince Pine and King Fret send a message asking for help, and so Mario and Yoshi arrive to fight Bowser and return the gems. You move along a set path while riding Yoshi. 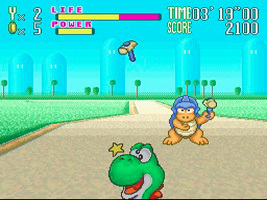 Using the Super Scope, shoot the enemies from your path and protect Yoshi from their attacks. You can hold the trigger down to rapid fire or let the Power meter refill for a charged shot. Each stage has its own traps and split paths. Yoshi can jump, and special markers on some stages allow Yoshi to do a super jump over dangerous ground.